Multidiciplinar and thus cost effective. It goes without saying that all our products are custom-made. In the first contact we investigate the general problems and needs. For this contact we take enough time without charge. Subsequently we write a project proposal which contains all research activities step by step. We conduct our work in well separated phases so that you have a clear view on costs and progress during the project. Acquiring data in a telemetric way. Use and represent data in a flexible manner. This requires the right tools. The picture displays a tool written by us in which we can use the results to perform meta-experiments with devices. Using a clever way of data recombination we can define the experiments in an optimal way. This is quicker and therefore cheaper. Apart from the software for the office environment, also "technical software" exists. This software is special in the way that its primary task is to perform (complex) calculations for specific computational problems. For example, this can be the data collection and analysis for the data acquired by your measurement devices. Or it can be an application that makes designs for specific constructions, using physical models. Of course, we take care of a smooth interface also. ... carrying out complex data analysis. Two short audio wave fragments. When can they be considered equal? The real time retrieval of usable and correct information from data obtained by measurements is a special 'craft'. How, for instance, can you determine if two audio wave fragments are identical? Or, how do you extract the dimensions of an object from just a photograph? And how do you make use of a thermal sensor for flow measurement? These are all questions related to an intelligent refinement and treatment of data streams. We can color the black box for you which is inbetween the sensor and the required property. ... technical support at product development. Together with Bèta Research our customer constructed a facility for the conduction of experiments for testing and improving special devices. The facility is special because for this particular device special safety precautions where necessary. 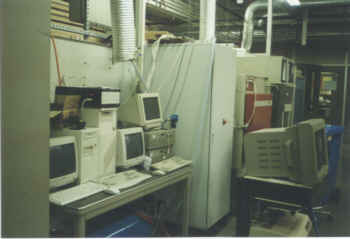 Data acquisition as well as control of the experiment can be done by telemetry. At the development of new products which are technical in nature it is necessary to make improvements in a systematic manner. Also, the follow-up tests must be done systematically in order to be sure that the improvement is significant. It is important to make statements with known accuracy (in a statistical sense) regarding performance and loss. With well planned research it is possible to have this knowledge at your disposal before the large investments are done. ... feasibility studies and second opinions. Back your ideas with a solid analysis. With a feasibility study from Bèta Research it is a lot easier to get money from investors. Invented something new? Has Gyro Gearloose visited your office with his latest invention? Do not take any changes. Check if his ideas or inventions are feasible. Especially with technical products care is mandatory. 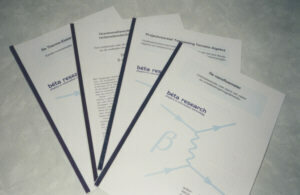 It is therefore wise to get the independent opinion from Bèta Research. Or maybe as a 'second opinion', just in case.